Laser Ablation is a process where an intense laser beam is focused on a solid sample until a portion of it evaporates or sublimates. A plume of vapor and fine particulates are then swept into an atomizer by the flow of an inert gas. Laser ablation is appropriate for conductive or non-conductive, organic or inorganic, and powdered or solid samples. 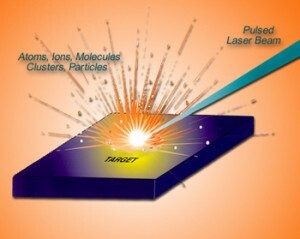 The laser can pulsed or be continuous. In pulse laser ablation the time of pulses can vary over a wide range of milliseconds, which can be highly controlled. This is important for many applications including microanalysis and nano-material (Mao). The total mass ablated from the sample per laser pulse is referred to as ablation rate. With a continuous wave, it is possible to ablate a sample with a continuous laser beam, if the beam is powerful enough. A nebulizer is a device that introduces a liquid sample into the AAS. Here, we will discuss the most common types: pneumatic and ultrasonic nebulizers. 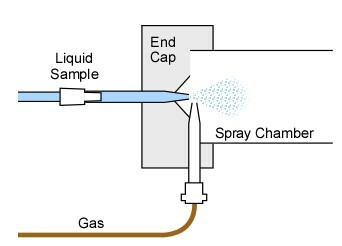 A pneumatic nebulizer converts a sample solution into an aerosol of tiny droplets using a jet of compressed gas. 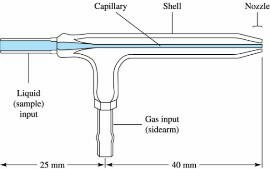 The flow of inert gas carries the droplets to an atomizer. Several versions of pneumatic nebulizers are available and a few are shown below. 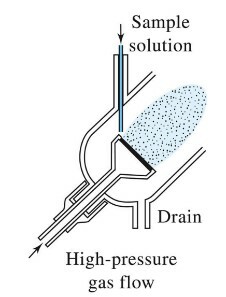 An ultrasonic nebulizer creates an aerosol of tiny droplets by pumping a sample solution onto the surface of a piezoelectric crystal that vibrates at a frequency of 20 kHz to several MHz. 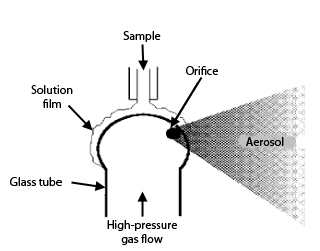 The vibrations convert the sample into a dense and more homogeneous aerosol than what a pneumatic nebulizer can achieve. However, viscous liquids and particulates lower its efficiency. The aerosol is then carried to an atomizer by an inert gas. Mao, Samuel S. “Laser Ablation Fundamentals & Applications.” University of California at Berkeley. Web. 4 Apr. 2014. <http://www.jlab.org/FEL/LPC/05lpc-mao.pdf>.